I guess we don’t have to wonder what Alex’s sauce is. 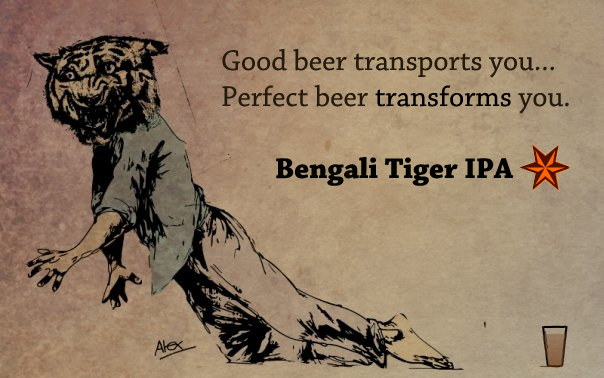 His charmingly stylized submission to Beer Is Culture bears a new motto for the Bengali Tiger IPA. The transformative power of beer is something that we’ve been working on at Sixpoint, although we didn’t aim to go quite that far with it. In any case, this piece tells its unique story through great illustration, bold color, and text that reminds us of an antique ad. Somehow, we’re also reminded of werewolf movies from the 1980s looking at this image. Beer is popular culture? Check out more of the designer’s work at his website for digital design services. We stopped him for a few more questions on all that below. AK: Depends on the mood and day entirely. Most days I’ll shoot for a Bengali Tiger (the inspiration for my submission). However, the Sweet Action (and Double Sweet Action) are indeed sweet as well, and the Pumpkin Brewster is one of my favorite fall treats. Where did you learn the tricks of your trade? AK: Most of my work is commercial and for a client – and I think there’s no shame in doing work you love and getting paid for it. Sometimes doing a solo project is fun, but being tasked by a client with a specific idea in mind and putting my own spin on it can be even more fun! The blissfully peaceful part of rural Connecticut where I grew up is also a place I can go to really get my juices flowing. What thoughts, sensations, revelations, or ideas do you hope people take away upon viewing your work? AK: In my illustrative work, I love to work with texture. Almost all of my work is pen & ink — I’m a slave to the line. I don’t like to fuss too much with color, and when I do use it I employ it to accomplish a specific task. I hope my viewers get a sense of drama; coming from an animation background I’ve always tried to capture a sense of movement in my works — I’ve never been one to do still lifes or landscapes. If you had $1 left and the world was ending tomorrow, what would you spend it on? AK: Unfortunately there’s not much a guy can get for $1 these days. I’d toss the dollar to the wind and spend my last day lounging in the sun with my beautiful girlfriend in Prospect Park. Why do you think “Beer Is Culture”? AK: Beer is culture because it brings us together. I lovingly refer to beer as “social lubricant” as it can bring otherwise strangers into deep conversations which they wouldn’t have otherwise. Only one thing’s better than sharing a beer with some strangers and talking for hours — sharing a Sixpoint!